I’m pleased to turn my blog over to Joey Paul today. Welcome, Joey! She writes YA crime, paranormal and general fiction. Hope you’ll give her a read and start a conversation in the comments. One of the things a lot of people will tell you when you’re newly diagnosed with a chronic illness, or suddenly finding yourself identifying as disabled is that you shouldn’t let it define you. They say that your illness, condition or disabilities are not you, and while that is true in part, it’s also true that it’s part of your identity. It contributes to who you are, whether you want it to or not. I’m finishing up a degree in health and social care and a number of my courses have dealt with self-identity. What I’ve taken from those lessons is that how you, as an individual, choose to identify is made of the labels you apply to yourself. For me, one of those labels is that I’m disabled. When I became ill at nineteen and was retired on medical grounds from my government job, I didn’t want to accept the disabled label. Despite the fact that for the majority of my adult life – in fact most of my whole life actually – I had been in and out of hospitals with my lung issues, and then was diagnosed with M.E and Fibromyalgia, I still didn’t really see myself as disabled until I finally faced that it was a part of me. I don’t see it as a bad thing. It’s just part of who I am. Just as I am a writer, and a student and an amateur musician, I am also disabled and I see nothing wrong with embracing that. A lot of the world view on disability is negative. There are fairly few disabled characters in mainstream media, books, TV, movies and usually when there is one, they’re painted in a negative light. They’re the bad guy. Or the poor person who lost all the good in their life and would be better off dead now that they’re disabled. It doesn’t really give the disabled children and young people growing up these days anyone to look at and see that actually, being disabled can be empowering. It doesn’t have to be a bad thing when to be honest; there is already a lot of negativity around it already. If anything, becoming disabled and allowing myself to see the good in it, made me who I am today. Yes, I admit, I had other plans for my life. I was going to be a doctor and help people. I was on track until I left secondary school and went to college. When my health started to get bad, I dropped out and decided to try my hand at working for a living. I went through a string of jobs, but I made ends meet and had I not fallen ill with M.E and Fibro, then I would probably still be working at the same job. I never saw writing as anything other than a hobby. I never saw it as a way to make money, or a way to spend my time constructively. Sure, my diagnoses and conditions changed the course of my life forever, but I can’t honestly say that it was all bad. I’m thirty-two now and was first published in 2005. Now, I have six books out with a seventh due out in the summer. I am writing the final chapters of my eleventh and twelfth books and although I have met many bumps in the road, I’m happy. I love what I do. I love writing and while I wish I could have come to this point without the pain and fatigue, hospital appointments, stays and all the other crap that comes with being disabled and chronically ill, I did come this way, and it did bring me onto this path. My point is this: Disability and chronic illness carry a lot of bad and negative things along with them. However, I see nothing wrong with saying that yes, I AM disabled and I DO see it as part of my identity. I’m not allowing my conditions to control me or to define me, but they DO make up part of who I am and who I will always be. I’m Joey, what’s wrong with that? 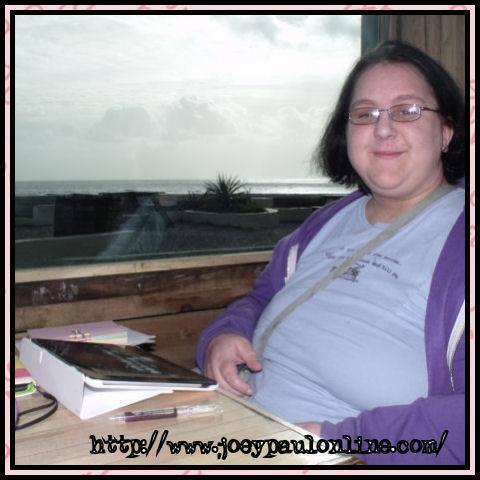 Joey is 32, disabled, a writer and part time student studying towards a degree in Health and Social Care. She loves to write and is at the moment working on her eleventh and twelfth books, as well as preparing her seventh book for publication. She started writing when she was medically retired from her job at the age of 19. Her first book was released in 2005 and after a brief time away, her second one was released in 2011. In addition to writing books, she also enjoys reading them and can often be found resting in bed with a good book, a cat and an ukulele. Great post Joey, good luck with your degree! Outlook can have so much influence on success, regardless of our limitations. I wish you all the best. Eleven books in such a short time is quite an accomplishment. Great post Joey. I know exactly how you feel and it is up to us to teach people that having an illness can be the start of something great!